The Polk Assist is a mixed bag so far. We feel the potential is there and it definitely sounds better than the Google Home, but we're just not sure exactly how much better it sounds. Yet. American audio company Polk Audio recently announced the Assist speaker with Google Assistant built in. The idea behind the Assist is to take all the ingenuity of the Google Home speaker, but give it better sound. The Home is a great product with great capabilities, but anyone who has heard one will know it's not exactly going to get the party started when you start playing music through it. It's something of a trend, with most audio companies now scrabbling to find a way to bring a more connected experience to their speakers, be that by working with Google, Amazon or in some cases, both. We've been able to spend a little bit of time listening to the Polk Assist to get an idea of how it sounds. We have to say listening conditions weren't perfect, so we will need a lot more time with it in a more normal environment, i.e., at home in the kitchen, to come to a proper conclusion, but for now, these are our thoughts. Making a speaker look great but for an affordable price isn't always easy. We feel like the design of the Polk Assist is inspired by the product it has been designed to better: Google Home. It's got a slightly angled top panel and a chunky base, although it's decidedly more square than the cylindrical Google Home. It's available in black or white, with the speaker grille wrapping around all sides. Don't let this fool you into thinking it delivers 360-degree sound though, as there is just a single tweeter and mid/bass woofer firing sound out of the front. On top there are buttons for playing/pausing the music, turning the volume up or down or quickly accessing Assistant to speak to it - you'll likely use this button if the music is too loud for Assistant to hear you say "Hey Google". The Assist has some weight to it, which infers this is a premium product, which it is of sorts, at least compared to Google Home. It's sturdy and well-built and we have to say we like how it looks. It's bigger than the Home so will take up a little more space on your counter or tabletop, but ultimately it's still a compact speaker, and aiming for the same market - the kitchen. This is where things get interesting. As we said, we've briefly listened to the Polk Assist in less than ideal conditions, so we'll reserve our full judgement for when we get to hear it properly. However, we've been able to listen to some clips of Simon and Garfunkel's Sound of Silence and Inspector Norse by Todd Terje. Two very different songs but good testers for a speaker. When the drums in Sound of Silence kicked in, we weren't exactly blown away by the Assist's performance. It wasn't terrible and we didn't want to immediately stop listening, but we expected a little more bass. The speaker was placed in a very large room and with no solid surface behind it, so we'll give it the benefit of the doubt for now. Inspector Norse did improve things though. It's a dance track with keyboards and drum machines and we did find ourselves tapping our feet along with the beat. The Assist sounded more lively and exciting, even at a low volume - we were restricted to how loud we could make it go due to other demonstrations in adjoining rooms. So where does that leave us? First impressions suggest that it's a step-up from your basic Google Home speaker, but then you'd expect that as it costs a little more too. We've been impressed with some other GA speakers - like the Panasonic GA10 for example - and as more of these speakers come to market some of the decisions will simply come down to which design you prefer. The big sell for the Polk Assist is that it has Google Assistant built in. This means not only can it control all aspects of the speaker, but it does everything the Google Home can do, such as controlling any other compatible smart home products you have at home. There were some issues with picking up the "Hey Google" command during our demonstration, but Polk representatives said it was because the speaker was placed higher than it would be in the home, so the mics can't pick the voice up. There's countless things that can go wrong in demos, so we'll reserve judgement until we get to spend more time with it. It also didn't respond well when music was playing, so the Assistant on the button had to be used too many times for our liking - again, something to examine in more details at a later stage. What we will say is that our experience with Alexa - which is built into Polk's Command Bar - gave a much better response in demos. Of course one of the great things about Google Assistant is that it continues to develop and expand its skills. One of the great things for speakers like the Polk Assist is that it over the coming years, it will only get smarter. It's a mixed affair so far. We're keen to listen to the Assist in better conditions as we know it does already sound better than the Google Home, so mission accomplished there - but we want to see just how good it can sound. 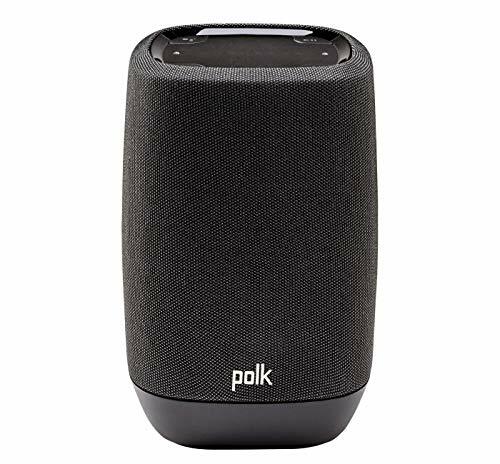 The Polk Assist brings variety to the smart speaker market, adding another brand to the mix and giving you another choice when it comes to selecting a smart speaker. Priced at $200, it's right in the mix - we just need a little more time to evaluate the performance.